Plenty has already been written about Starter Bakery’s remarkable, world-beating kouign amann (pronounced something like “Queen Iman”). Suffice it to say the hockey-puck-sized pastry — a distant, slightly sticky cousin of the croissant — is dangerously habit-forming: crisp and chewy, salty and sweet, and luxurious in the way that things made mostly of butter and caramelized sugar are. If you’re a Bay Area cafe-goer, chances are you probably already know two or three different places that carry them. But maybe you didn’t know this: Oakland’s Highwire Coffee Roasters now sells an espresso custard kouign amann — decadence on top of decadence. Following a tip on Chowhound, I headed over to Highwire’s Rockridge Market Hall retail shop (5655 College Ave.) to check it out. Starter Bakery co-owner Brian Wood told me he makes the coffee custard by infusing vanilla beans and ground Highwire espresso beans into milk and cream. He makes a pastry cream out of that infusion and fills the kouign amann dough with it just before baking. “The flavors pair so well,” he said. Starter Bakery makes the espresso custard kouign amann exclusively for Highwire, but Wood said they’re also sometimes available at weekend farmers’ markets (Grand Lake on Saturdays, Temescal and Lafayette on Sundays). 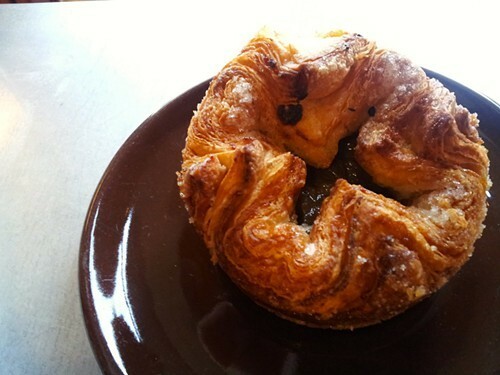 In addition to the standard kouign amann, cafes and other retail shops carry seasonal (often fruit-filled) varieties.